K3/10 @ 5 Watts to a 40M extended double-Zepp and a 20M wire delta loop. Tried 15m with no luck. Made 12 QSOs on 20M, 7 on 40M and 3 on 80M. Worked N4BP on three bands and four others on two bands. Nice to hear some new (to me) calls - Thanks to all. Had fun. Ended up going the tubby route this month. Used my Ten-Tec Jupiter at 5 watts with assorted accessories to a mini beam at 25 feet, an inverted vee for 40 meters at 40 feet and a ground mounted homebrew vertical antenna for 80 meters. The money band was 20 meters - I haven't operated 20 meters during a Spartan Sprint in a long time, if ever!!! Made a few Q's on 40 meters - about the same number as when I use my Ten-Tec 1340 homebrew. Was hoping to add some 80 meter Q's to the log but no SP'ers there - maybe next month. Thanks to everyone that participated and thanks to the organizers. The Spartan Sprint always makes for an enjoyable evening. Hope to hear you all next month. K1 at 5w into wire vertical. Too much fun!. Thanks to all! Thanks to W5ESE for the QSO! First Spartan Sprint. 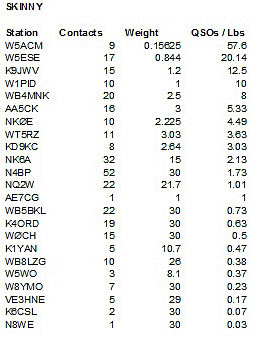 Only 5 Qs with a Yaesu FT-817 running 500 mW and a G5RV at 30ft. Lots of QSB on 20 and not many Sprint signals on 40. N4BP'S 20mtr signal was "BIG"!!! My power was 100 MW to outside dipole 12' high. Ran 5 watts out of my ATS-4 to a new 43 foot vertical with an autotuner at the base. Condx on 20 were the pits (2 Qs) but 40 kinda started kicking in about an hour into the event but it just wasn't that much fun the first hour with only 12 Qs so I pulled the plug. Great to work Bob, N4BP, on 20 and 40, with the new antenna, especially getting a good report from him on 40! ATS-4 at 4W with an OCF dipole. Band conditions were pretty good. 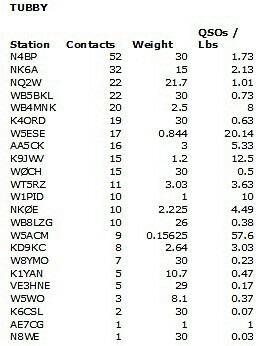 Best DX NK6A in CA and W7OM in WA. Highlight was working Bob N4BP on 3 bands. I miss the old spirit and the participation. Thanks all. Operated 20m fer abt 1/2 hr of the sprint. Vy gud condx with good sigs. Even K1YAN wid 1/2 watt doing FB here in Michigan. I'm a bit on the "tubby" side this month, K2 powered by deep cycle marine battery, and solar charged. Not exactly portable, but getting ready for Field Day. K3 at 5W to a Force 12 and using a new to me Graciella Begalli paddle. A lot of QRN and marginal conditions in So. CA. tonight. A few Candians and one Hawaiian station from the back of the beam. I started on 20M and stayed there with the exception of a single contact with WB5BKL on 40M and a single contact (once again) with WB5BKL on 80M. Conditions were not great, but acceptable. It was fun making contacts on 20M with NY, WA, CA, CO, OH, FL and LA. The antique vertical was working well and the 170 mAh LiPo cells did great, even with periods of calling CQ. The power output stayed around 3 Watts for the duration. Began the night with WB5BKL on 20M and he finished me up on 40M. In between, I had a contact with XE1MW, Carlos of Mexico, who I do not believe knew he was catching a sprinter, but who was nice enough to make the exchange. I hope he comes back and joins us. Lots of noise at my QTH, everything seemed S7 or more, so passed many really faint signals, especially those ganged up in such a narrow range! It's been a while since I've worked the SP, but really enjoyed working the gang tonight. Hope to participate more often in the future. Worked FL,MN,CA on 20M, then to 40M where I had S7 to S9 QRN,best dx was WA, hope I got everyone that called. Thanks to all. Surprised with KH6B in Hawaii on 15 meters. Tough night. 20m yielded 2 contacts, 40m got me another 6, for 8 total. My son has just decided that he is getting married, wonderful news. www.qrz.com/db/kc0wky. He called on the phone and that took about 30 min. out of my time. Still - the bands were rough. I skipped over the stations running 100+ wpm and stuck to the guys around a sedate 15 wpm or so. And I got to work my friend Jim in Utah. Congrats to Ron WT5RZ - he beat me! Thanks to the eight who heard me. Better luck next month, but I will be in Germany with an Alex-Loop. I might give it a try - so listen for me at about 15 wpm. Had fun and 20 meters was working real good. Thanks to all that I made contact with and hope to see everyone next month. played for about an hour using my K1 w/internal lithium AAs running about 2W into a half-size G5RV along the side of the house. Used my mouse paddle and logged with GOLog on my Handspring Visor connected to a portable Targus keyboard. This is going to be my setup for FD this year and the Sprint gave me a chance to see how things would work. Condx didn't seem great but if I could hear 'em I could work 'em. 20M was outstanding for the first 30 minutes. QRN on 40M is getting potent as we approach summer in the SE, but many signals were well above the noise. Even managed to squeak out a couple of QSOs on 80M. Thanks for the Qs.